ENJOY THE BEAUTIFUL MAUI SUNSET! Sharon's spacious, 1,300 square foot Wailea Ekolu condominium is a two bedroom, two bath, ocean view unit. Located on the ground floor, it is surrounded by grass and lush island foliage. The condo accommodates four people comfortably. The unit is tastefully decorated with island fabrics and decor, including large screen cable TV in the living room and flat screen TV in master bedrroom, large washer-dryer and many personal touches for your comfort and enjoyment. WiFi is included. The condo has a fully equipped kitchen with all the small appliances needed for your stay and many pantry items. Towels, linens, beach towels and chairs, cooler and beach umbrella are included. Ekolu 807 also has its own double burner propane BBQ for candlelight dinners on the patio. The condo is cooled by tropical breezes (no air conditioning). Set among seventeen acres of beautifully maintained grounds, Wailea's Ekolu Village is located on the 'dry side' of Maui, close to beautiful stretches of white sand beaches, superb for swimming, snorkeling, and water sports. Guests can enjoy magnificent sunsets while watching whales migrate December through March. Ekolu has two swimming pools available. The closest one to the condo is a convenient sixty second walk. ATTENTION GOLFERS - Among the world's great golf destinations, Wailea is renowned for its ideal golf weather. The Wailea Golf Resort is rated among the best golf courses in the country by both Golf Magazine and Golf Digest. The championship Gold, Emerald, and Blue courses boast dozens of prestigious awards. Golf discounts are offered for Wailea guests. Two award winning courses designed by Robert Trent Jones, Jr. are only a short drive away at Makena Beach. Also available within walking distance is the Wailea Tennis Club, rated for more than a decade as one of the country's fifty best tennis resorts, six luxurious hotels, and the Shops at Wailea, featuring upscale shopping, art galleries, fine dining, and entertainment. Sharon and her husband travel from California to Maui several times a year and consider Wailea their second home. Their condo has everything you need for your Maui dream vacation! I am the Property Manager for owners, Sharon and John Stephens. My name is Colleen Mitsuya. I am island-born, originally from Honolulu. I've been here for 42 years, Maui is my home now, Maui No Ka Oi! My favorite things to do are ballroom dancing and line dancing and I love arranging flowers, especially for all our guests to welcome them to our condo and to Maui. Sharon and John fell in love with Wailea on a trip to Maui in 1979. The area was just being developed. In 1984 they purchased their Ekolu unit and over the years have traveled countless times from Los Angeles to Wailea with their daughter Jennifer. Time has flown by and now their family trips include their daughter, son-in-law, and beautiful granddaughter who loves to snorkel, paddle board and is learning to surf. John and Sharon love the quiet, residential, park like feel of Ekolu Village. The beautiful lush tropical foliage and ocean view, relaxes them the minute they arrive. Wailea is close to many unique sightseeing spots if you want adventure and a little action but when you return life is quiet and non touristy. It's a golfers paradise! A first rate tennis facility is right there and well as every water sport. The weather is fabulous! Since Wailea is on the dry side of the island, it can be raining in Kapalua and sunny in Wailea. Beautiful white sand beaches are within walking distance. Wailea has walking paths all along the ocean front for exercise and or strolls. Beautiful ocean views and sunsets from private lanais, living room and master bedroom. Private full size washer/dryer in the condo. Many spices provided and well as napkins, paper towels, etc. Serving pieces for entertaining, placemats, linen napkins, etc. Large flat screen TV in living room. Master bedroom also has wall mounted flat screen TV. beach toys, beach buckets, etc. 2 pools on Ekolu property. Nearest pool is just a 60 second walk away. Closet with beach chairs, beach towels, beach umbrella, cooler and beach toys, including boogie boards. Books and games. We thoroughly enjoyed our stay at the Wailea Ekolu. It was nothing fancy, but everything we needed, and quite comfortable. I particularly appreciated the little things, like beach stuff to use, and spices and such in the kitchen, that meant we didn't have to go shopping for things we might only use once. Colleen checked in to make sure we had everything we needed. The washer/dryer combo was also helpful. The pool was adequate, though did close for a few days for cleaning. 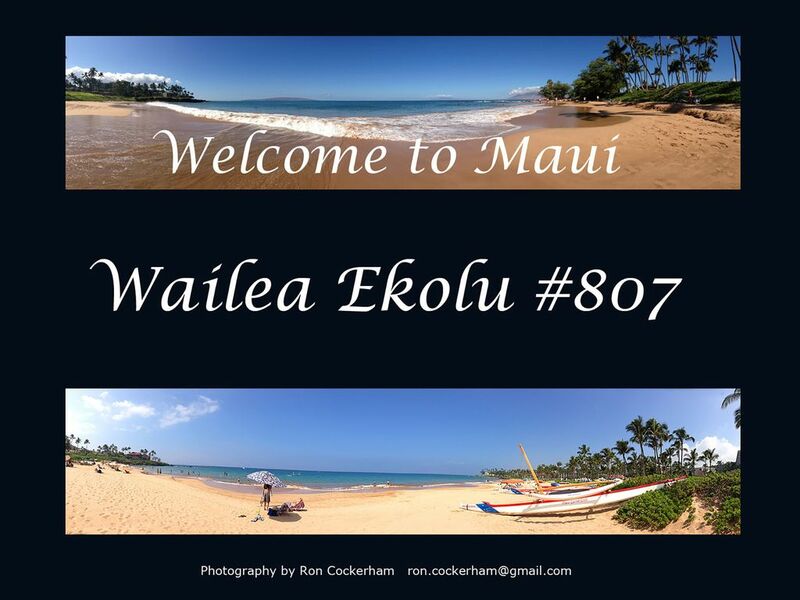 The location in Wailea was good, and the guidebook gave us useful suggestions about beaches, restaurants, etc. We are more than happy to recommend this place to others. We enjoyed sitting on the lanai and having an awesome view! If you are into golfing, this condo is in a perfect location. Colleen was fantastic to work with! We would stay here again if in Wailea. There is no a/c, so one evening with no tradewinds it was rather warm but did not ruin our experience in any way. Loved the condo. In a superb area, lush vegetation, totally peaceful and just what the doctor ordered! No need for AC - trade winds took care of that. Was wonderful to sleep with the windows open and wake up to the birds chirping. The resident cats were friendly and we looked forward to their daily visits. Plenty of space for our 3 girl getaway. Will definitely stay here again. We were travelling to Hawaii for a golfing vacation. Colleen's condo was the perfect location, very spacious and comfortable for three adults. Everything we needed for the perfect rest was just minutes away – shopping, golfing and relaxing on the beach or by the pool. It was rather unfortunate that it was unusually hot during our stay, or the condo would have been more enjoyable with just the ocean breezes. But we did make use of the extra fans provided. Colleen is very attentive to everyday needs - she supplies fully stocked kitchen, all beach necessities, and even a welcoming flower arrangement. We really hated to leave. For taking the time to write a lovely review for Ekolu 807 and me. I do appreciate your kind words and thank you for leaving the condo spiffy clean and helping me with clean sheets, towels, and dishes. I'm glad you enjoyed your stay here! Please come again! My family and I stayed at this lovely condo for 5 days while celebrating my niece's wedding. The home is lovely,with all the basic amenities for cooking and living. The washer and dryer were a big help. There are even beach towels and chairs for our use. Coleen left a stunning flower arrangement which graced our table during our stay. During the time we were in Maui the weather was unseasonably hot - over 90 degrees. With the lack of AC, even with the fans provided, we were uncomfortable. this was listed in the description but probably not as prominently as it could be. Take into consideration how important AC is to you and the time of year as you make your selection. If it were not so hot, the apartment would have been perfect. Thank you. Colleen. Wailea Ekolu Village is a beautifully maintained complex, quiet and private. Grass and lush tropical foliage surround the units. We provide beach toys, boogie boards, beach towels, chairs, snorkels and fins, coolers and a beach umbrellas for our guests. Nearby water sports businesses can help you with paddle boards, surf boards, snorkel trips, etc. 4 person maximum (of any age) Should your plans change, please phone or e-mail Colleen Mitsuya, (dewatson@hawaiiantel.net, 808-283-1895) so that a substitute booking can be found. If we can rebook your	days, we will refund your deposit and/or final payment less a $25 handling fee. If not, the deposit and/or final payment is forfeited. A 1.25% fee is added for international credit cards.